As continuation of my adventure with Shetland haps’ knitting, which I blogged about in this post, for the last couple of weeks I have been working on a set of patterns for Shetland-style wraps for everyday use. The idea was to knit three haps in one colour scheme, with some pattern elements staying the same in all the pieces and some other motifs being very different between the wraps. 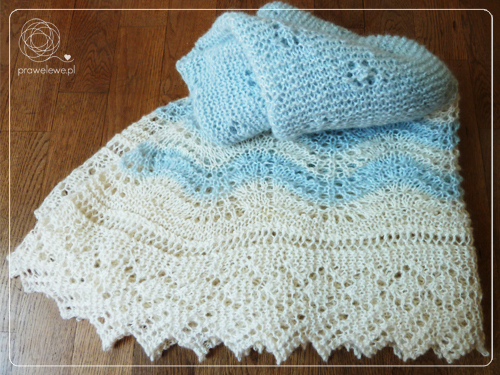 The expected result was to create a family of wraps that would be both enjoyable and challenging to knit, and introducing obviously similar, yet versatile patterns. The name for the set—Arctic Aura—came to me the very first minute I saw the fibre that was supposed to be used for these haps: hanks of slightly off-white and bright blue, two-ply yarn with tiny bit of fluff, which imidiately brought a picture of a sunny winter day with crystal clear air, cold but refreshing breeze and sunlight reflected by snow, bouncing off snowflake-frozen window glasses. Since there were more white than blue hanks to work with, I decided to design one hap in white only and two other haps with blue centre squares. Then I found out the way to go with this set: to create a wrap for land, another one for water and yet another one for air, all in arctic colours. Old Shale border pattern was already something I tried (and liked very much) that is why my choice to go with this pattern first was quite obvious- while enjoying the familiar wavy border, I gave myself a chance to focus on all the other, new elements that I wanted to incorporate in the first Arctic Aura hap design. The first hap in the Arctic Aura set, Arctic Water, is based on a garter-stitch central square knit diagonally, the same way as in the Old Shale Shetland Hap but this time I added a traditional Shetland lace element, a Cat’s Paw motif, that is repeated regularly on the whole central part’s surface. Around that central square is the wavy Old Shale pattern, again, the same one I used in the Old Shale Shetland Hap, except that the corner is designed differently so the waves flow there in a new way. Finally, this piece is finished with the hap-traditional bind off, i.e. 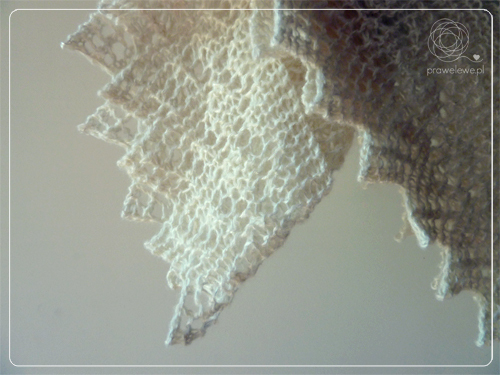 peaked edging in a full version, which includes a diamond lace element. 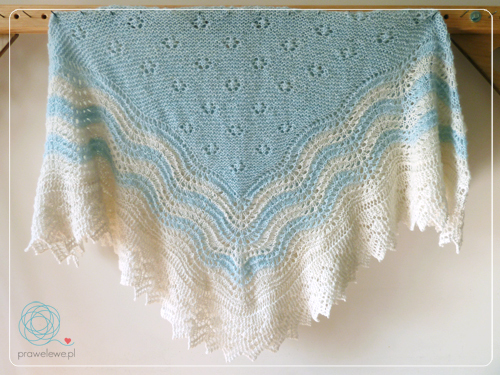 This hap is the squishiest and the heaviest in look of all the three Arctic Aura pieces. The patterns is written in such a way that the size of the finished wrap depends on how big the centre square you decide to make. This time I went for a bigger size for my sample than in case of the Old Shale Shetland Hap, which due to the certain amount of yarn available was knitted as a lap hap version then. Arctic Water is 145 x 145 cm/ 57 x 57 inches and uses 1050 m/ 1140 yd. of yarn. It is very easy pattern and I encourage everyone to try. 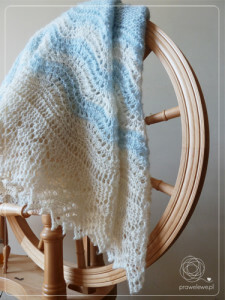 There are some tricks to deal with but they are all explained in the instructions (how to move in different directions, pick up stitches and bind off), and although those might seem discouraging for beginner knitters, they are in fact very simple to understand and incorporate in your work. 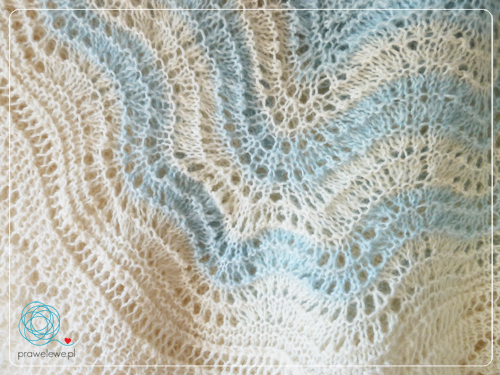 The pattern is available from the pattern section → Arctic Water. Other haps in the Arctic Aura family are: Arctic Air and to Arctic Land. Enjoy working with the instructions and please do share photos of your WIPs and FOs in my prawelewe group on Ravelry. It would be lovely if you left the comment below, too. Dziękuję Kasiu i Irishmagda za komentarze. dziergało się go cudnie więc polecam. Niedługo będzie akcja wspólnego dziergania- ogłoszę wszystko. Zapraszam do zabawy.